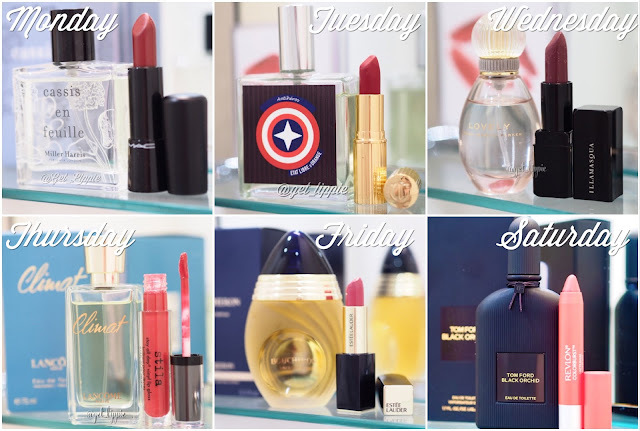 This week, I basically took a “lucky dip” approach to my perfume and lipstick choices. After three months and nearly 80 lipstick and perfume pictures, I realise I’m probably something like a quarter of the way through my fragrance collection, and possibly, maybe, a tenth (perhaps?) of the way through my lipsticks. There’s a few months of this to go, yet, I think! Monday was Miller Harris Cassis en Feuille, which bears a passing resemblance to Jo Malone London’s Blackberry & Bay (a perennial autumn favourite), but just has a little more grassy vetiver in the mix, so has a little more … oomph. I wore it with MAC All Out Gorgeous, which is rather aply named. Tuesday was Etat Libre d’Orange’s Antiheros, which is the lavenderiest lavender there ever was. Luca Turin described it as “cheap lavender soap, but strong”, and so it proves to be. I’ve missed lavender a lot whilst I’ve been parosmic (up until recently, it has smelled burned and awful), and to have it back is wonderful. Lavender contains such a variety of scents, it’s herbal and floral, and has a hint of balsam, and mints in there too. That it is maligned as a “granny scent” is an eternal mystery to me. I wore it with Charlotte Tilbury’s Red Carpet Red which is one of the best red lipsticks ever. Wednesday had me in something just a little more ladylike, the musky prettiness of Sarah Jessica Parker’s Lovely. I only like a couple of celebrity fragrances, and this is a good one. It reminds me of Narciso Rodriguez, only at a much more acceptable price-point. I wore it with Illamasqua Stark, which I also like very much, though it’s a little patchier than I recall it being on application. Thursday brought a board meeting and Lancome’s Climat – a little-known fragrance from Lancome’s back-catalogue. It’s a sweet and powdery ladylike little whisper of a thing, a proper “Grown-Up” fragrance so I rarely wear it, for that reason. Paired with Stila Long-last Lipgloss in Firey (I think, the label has worn off), it saw me through a board meeting where I managed not to kill anyone, so a winner, I think. Friday I wore Boucheron by Boucheron, which is a big heavy-hitter of a floral fragrance, in a beautiful bottle, designed like a piece of jewellery, which always delights when I spray it. Paired with Estee Lauder lipstick in Dominant, which is a very fine pink indeed. On Saturday I was heading to a party in Soho, so I wore the ultimate party-girl fragrance: Tom Ford Black Orchid, in the new eau de toilette formulation, still loud, and one of the happiest fragrances around, it’s a joy. I paired it with the Matte Balm from Revlon in Striking, which is the loudest red I own, and wore them both with sequins. A jolly good time was had by all. Previous Post LipsNspritz of the … er … Fortnight.